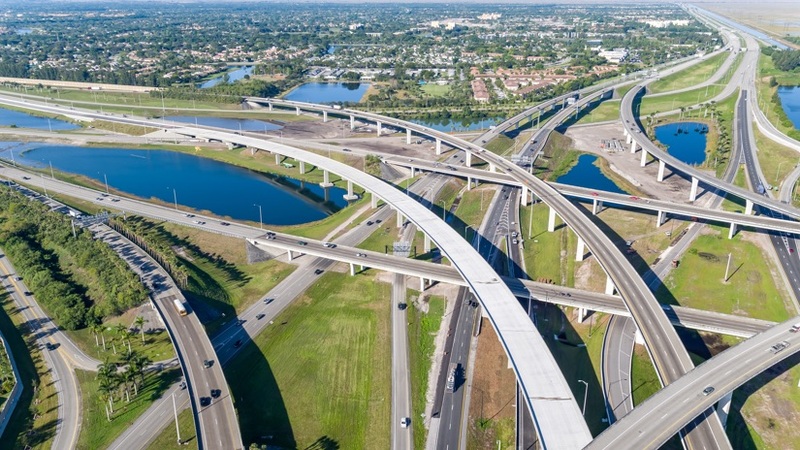 From major highway projects to bridge inspections, Terracon proves itself to be a leader in the transportation sector, providing geotechnical engineering, environmental consulting, construction materials, and pavement related services. We have a broad range of technical and management experience delivered to both public and private sector clients. In addition to traditional construction materials, environmental, and geotechnical engineering services, specialized highway and bridge services have included oversight and evaluation of pile dynamic evaluation, load testing of piles and drilled shafts (including statnamic testing) and lateral load testing of driven steel piles. Terracon has also provided extensive instrumentation for settlement observation, pile loading, and slope stability. Terracon has been instrumental in developing solutions to control roadbed and bridge settlement using extensive wick drain installation and monitoring settlement using pneumatic pore pressure transducers and magnet read switches. When it comes to pavement engineering and construction quality control consulting, Terracon is one of the best in the industry. Terracon has a strong history of providing comprehensive services and solutions for airport facilities of all sizes. Our experience ranges from apron and pavement engineering for smaller local airports to a primary runway pavement condition assessments following major pavement damage. Geotechnical and construction materials services have been provided for foundations, floor slabs, and pavements for new hangars, terminal buildings and radar towers. We have also provided services for the expansion and extension of airport runways and access roads. Our environmental services have included Phase I and II Environmental Site Assessments (ESAs), NEPA checklist, regulatory compliance, spill prevention, and air and groundwater monitoring. Terracon’s experience with railroad and light rail transit projects has ranged from major expansions of light rail systems in metropolitan areas including rail bed, transfer stations and parking garages, to major rail spurs and mainline track reconstruction projects. These services have included extensive stabilization of the track beds with respect to settlement using reinforced geogrid rail beds and extensive slope stabilization projects. We have provided air and groundwater monitoring, regulatory compliance, environmental assessments, and environmental impact statements, wetlands studies, and Phase I and Phase II ESA services for rail systems throughout the Midwest and Western states. Terracon has worked on many docking facilities across the country’s extensive river system including the Missouri, Mississippi, and countless other rivers. Services have included dredging and stability projects for riverboat docking facilities and substantial stabilization projects. Terracon has also been involved with many smaller docking facilities for fresh water impoundments for recreation facilities, marine seawall projects, floating docks, and levees. We have performed wetland mitigation, groundwater testing, and environmental remediation design. Liz Smith, P.E., G.E. D.GE.